Authors: Julie Hlavacek-Larrondo et al. Astronomers aren’t that different from physics students. We spend a lot of time working on hard problems, and after the long and sometimes winding road to the “answer”, we want to know if it makes sense. In physics classes, this process usually operates on an order of magnitude level (“No, that spherical cow doesn’t weigh as much as the sun!”); in science, we try to compare our results with the literature. Often, the most exciting breakthroughs happen when we realize our results aren’t what we expected, which is what happened when astronomers at the University of Cambridge compared their measurements of black holes in the cores of galaxy cluster with the rest of the black hole population and found that the most massive galaxies in the Universe host nuclei that are almost ten times more massive than they should be! Previous astrobites have discussed the rich phenomenology of stellar mass black holes (~10 M☉ and sometimes called “galactic black holes” or GBHs) and supermassive black holes (~1 billion M☉ and abbreviated as SMBHs), but the basic picture we have for both is essentially the same (see Figure 1). In particular, the formation of accretion disks is a universal phenomenon, since matter must shed its excess angular momentum before it can be accreted onto a compact object like a black hole. The production of relativistic jets also seems to be ubiquitous, with the properties of the jet closely correlated with those of the disk. Observationally, the accretion disk is generally detected via X-ray emission from the hot inner edge of the disk, while the jet produces radio-wave synchrotron emission due to charged particles spiraling around magnetic field lines. Because the rate of accretion is modulated by the mass of the black hole itself (cf., the Eddington limit), X-ray and radio luminosity can both be correlated with black hole mass, since they are proxies for accretion and jet power, respectively. Figure 1: This illustration demonstrates the similarity of Galactic black holes and supermassive black holes. In both cases, the black hole is surrounded by an accretion disk and launches a relativistic jet. Originally taken from this page. 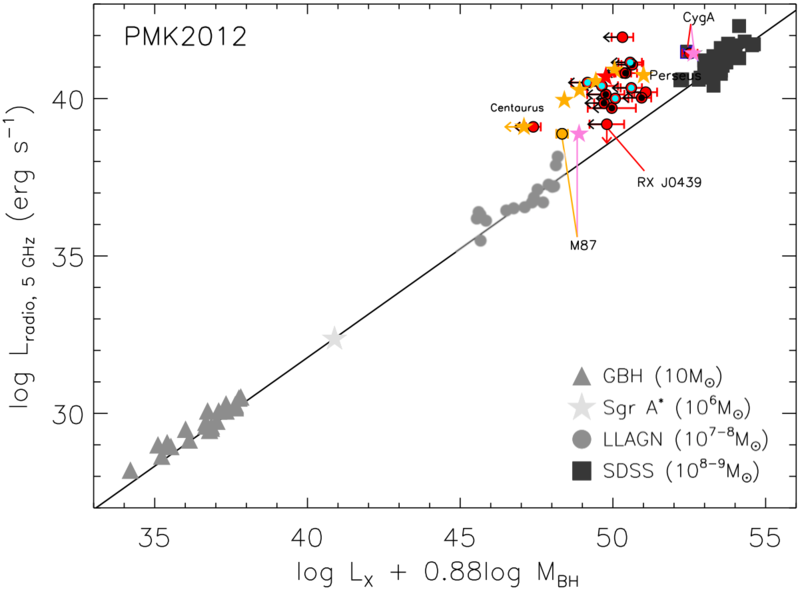 Remarkably, the disk-jet connection appears to be scale invariant, encompassing the vastly different sizes of the “ordinary” GBHs and the much more massive SMBHs. Because of this, astronomers refer to the correlation between black hole mass, X-ray luminosity, and radio luminosity as the fundamental plane of black hole accretion. The fundamental plane can be used to link models of black hole accretion at all scales and provides a useful tool for investigating the properties of populations of black holes. Julie Hlavacek-Larrondo and her collaborators have been studying some of the most massive black holes in some of the most massive galaxies in the Universe, the so-called brightest cluster galaxies (BCGs) found at the centers of nearby galaxy clusters. These galaxies are situated in the centers of deep potential wells, surrounded by hundreds of other galaxies and debris left over from the formation of the cluster. The gas between the galaxies is usually hot enough that it is completely ionized and radiates via thermal bremsstrahlung in the X-ray band, which should eventually cause it to cool and collapse onto the BCG, providing new fuel for forming stars. However, this is clearly not happening or there would be evidence of recent star formation, the lack of which implies there is some other source of energy keeping the intracluster gas hot. Many people suspect the energy comes from the central engines in the BCGs, but observational constraints on the properties of these black holes are poor, especially concerning their masses. In an attempt to shed light on this conundrum, the authors wanted to see if the central black holes in BCGs were consistent with the black hole fundamental plane. They already had X-ray luminosities from previous Chandra observations in hand and obtained 5 GHz radio luminosities from published results and archival data. Estimates of black hole mass were made several ways, depending on the available data. 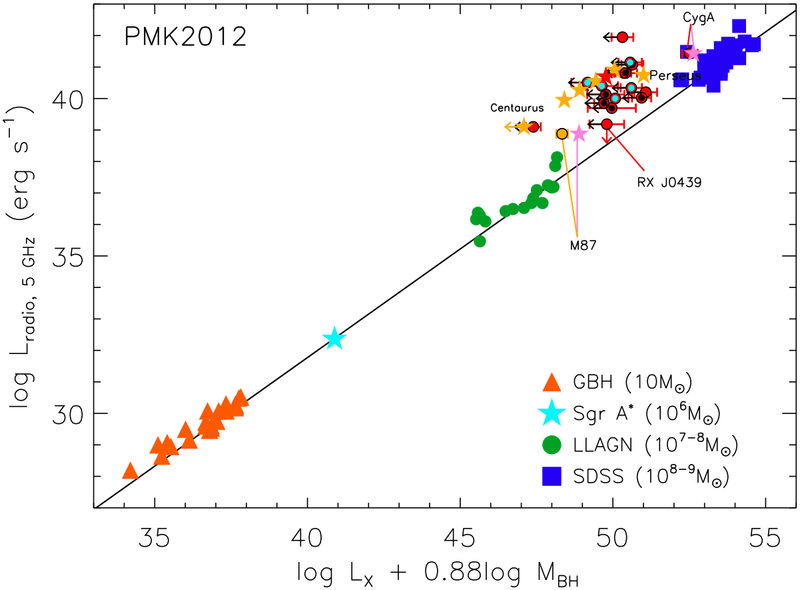 For most of the sample, the authors used infrared luminosities and the M-MK relation, which, like the M-sigma relation, correlates the mass of a galaxy (or, as a proxy, its absolute K-band magnitude, MK) with the mass of its central black hole (M). Figure 2 shows where the candidate BCGs lie in relation to the fundamental plane. Figure 2: The fundamental plane of black hole activity (best fit plotted as the black line) with samples of different black holes plotted on top. The sources considered in this paper (the colored symbols) lie systematically above the plane. 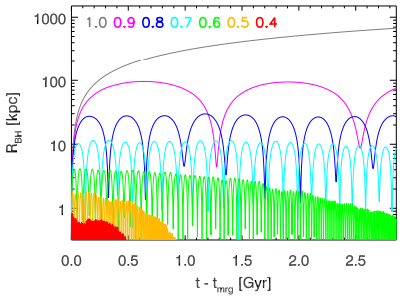 Clearly, the sample considered in the paper is systematically offset from the standard population of black holes, but why should this be the case? If you assume that they should fall on the fundamental plane, then the trouble is in the determination of one of the three parameters that define it: 1) radio luminosity, 2) X-ray luminosity, or 3) black hole mass. 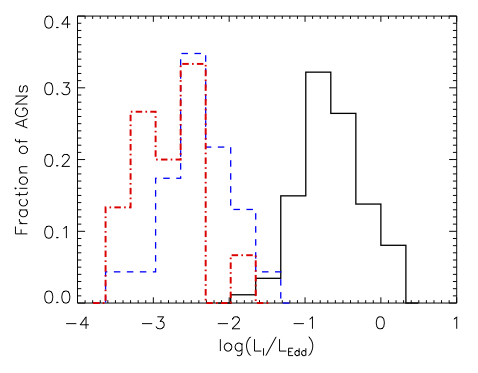 The offset could be explained if the authors overestimated the galaxies’ radio luminosities across the board, but they contend that their method is consistent with the methods used in the creation of the fundamental plane relation. Likewise, if the X-ray luminosities were underestimated, that could also account for the observed discrepancy. This explanation is more plausible, because X-ray emission from massive black holes can be affected synchrotron cooling, which causes the high-frequency part of the spectrum becomes fainter with age and no longer accurately reflect the true X-ray power. The authors comment briefly on this issue, but note that a full treatment of synchrotron cooling would require additional modeling. The authors’ favored explanation is that the actual masses of the BCG black holes are greater than those obtained using the M-MK and M-sigma relations, with implied black hole masses closer to a few 1010 M☉. This is not actually as surprising as it might seem, and the existence of these ultramassive black holes (UMBH) would help explain the curious behavior of the clusters discussed above. If the BCG black holes were indeed UMBHs, the power required to keep the intracluster gas hot would be less than a fraction of a percent of their Eddington luminosities. At this level, the black holes would be accreting inefficiently and have cool disks, consistent with the lack of bright X-ray point sources in the observations. The results of this paper offer convincing evidence that the most massive elliptical galaxies could be harboring monster black holes that defy our current understanding of the high-mass branch of the black hole “family” tree. However, to confirm or deny this explanation, dynamical mass measurements of black holes in brightest cluster galaxies are needed, which means there is still a lot of work to be done!